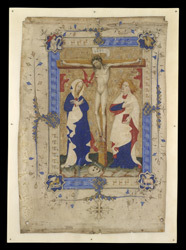 This Crucifixion miniature probably once faced the Canon of the Mass in a missal, but it is named after A. Wyndham-Payne, who bought it in a Cirencester antique shop in the early 1940s. It has been suggested that the leaf is not from a missal, but several features suggest that it is, including the narrower right and wider left margins (typical of the verso of a leaf in a book), and the cross in the lower margin, which the priest would kiss during the performance of the mass (to allow him to avoid kissing--and smudging--the main image of the cross). Examination under a microscope confirms the impression presented to the naked eye: that the areas of very pale draperies were probably intended to be painted, but were left unfinished.